The Buddha began life in the 6th century BC as Siddhartha Gautama, the son of a tribal leader, after six years seeking the truth he finally came across what is believed to have been called Buddha Gaya, and stopped under a tree by a river. He certainly relaxed there because it was said that 49 days later he attained enlightenment. 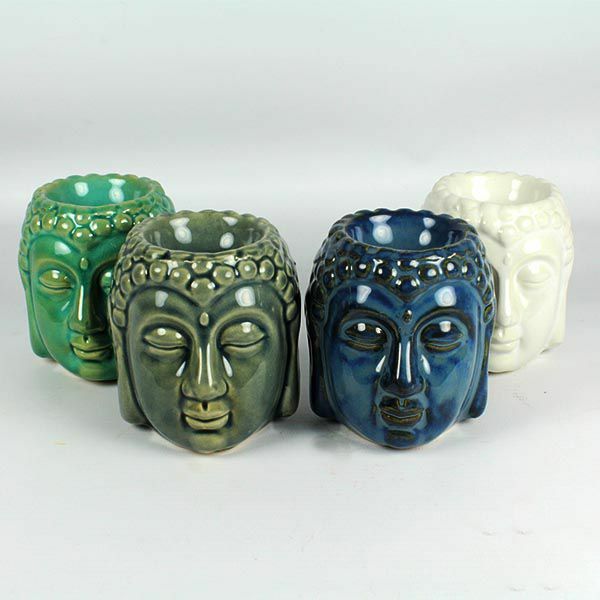 Well we can help you if you want to relax and to introduce a nice warm vibe in to your home with one of our Buddha head oil burners. It will become quickly apparent that after heating the essential oils, you will also slip into a deep meditation, and forget the stresses of the world by filling your home with your favourite aroma. We have a great selection of fragrant essential oils and the oil burner is simple to use. Place a tea-light into the hole at the back of the Buddha and allow the oil which is placed in the dip in the head to warm up and soon you will be relaxing. Naturally you should take care when using naked flames by taking care when lighting the tea-light in the burner, or when placing a lit tea-light inside. Naturally the burner may get hot during use, so allow cooling for several minutes before touching and of course keep out of the way of children. Available from us in four distinct colours: two shades of green, blue, as well as white, along with a great selection of oils. Soapstone is a wonderful product and it has been used for hundreds of years, Native Americans have used soapstone to make smoking pipes and pipe bowls. 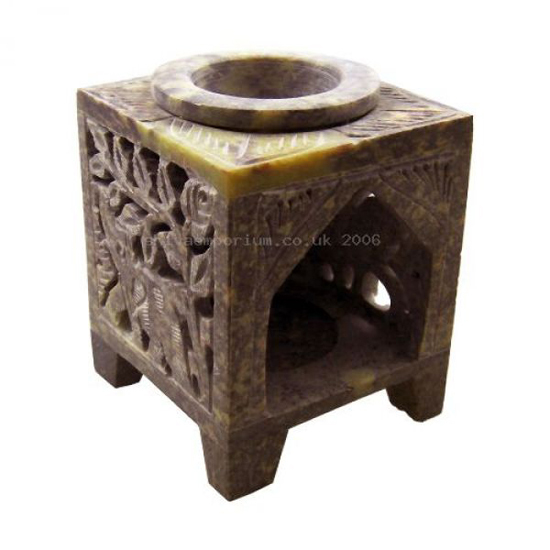 Easy to carve and tolerant to heat the product is perfect for our range of elephant oil burners; we do a great range and offer these in a wide variety of shapes and colours, each one is unique because of the nature of the soapstone. Our elephant oil burners give you a simple and cost effective way to fragrance any room in your home. With the rise in popularity of aromatherapy, oil burners are a fantastic way to fill your home with fragrances and they can be used over and over again. Naturally you should be careful in the home with naked flames, but the design of our elephant burners makes them extremely safe to use. Choose your favourite fragrance and never allow the burner to run dry, you can achieve some amazing fragrances and our elephant burner is very easy to keep clean and can be used over and over again. Check out the range of colours at our new products page and choose a favourite, remember your elephant burner will be unique, no two are the same.